We sure are starting off the New Year with some powerhouse energies! Our first Full Moon of the year will be on Monday, January 21st at 12:17am eastern time. If you’re a Moon lover as I am, you probably have the dates and times of when the next lunar event written down somewhere. With each lunar event, you can work your Moon ceremony/ritual/magic a day before and a day after the actual event. We have 5, yes 5 different cosmic energies influencing this month’s Full Moon. I’ll share some information about each individual influence in just a little bit. Typically, we begin feeling the lunar effects a few days or even sometimes a week before the actual event. January’s Full Moon is in the Sun sign of Aquarius and the Moon is in Leo. With these two opposing signs, we may find ourselves battling between two different paths of focuses. On one hand, Leo may be encouraging us to put ourselves first and take no prisoners as we do so. On the other hand, Aquarius is more focused on humanitarian efforts and what must be done for the collective consciousness. Let’s Delve Into The Details About This Full Moon Shall We? 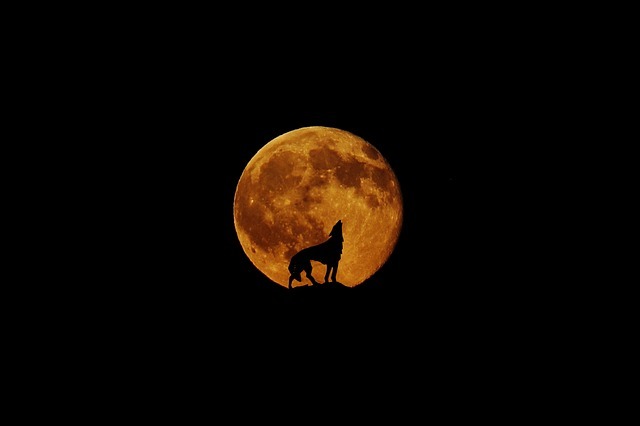 Wolf Moon – The Wolf Moon is the first Full Moon of the year and was given this name by the Native Americans. In the Northern part of the country, the wolves would howl outside on cold, wintery nights. They were hungry and used their voice to communicate their needs with Great Spirit. Some questions to ask yourself on the Wolf Moon are; What are you hungry for? Are you using the vibration and power of your voice to let your hopes and dreams be heard and known by Great Spirit? If not now, when will you? Super Moon – A Super Moon occurs when the Moon’s perigee is at its closest when orbiting the Earth. During its orbit, the Moon is very close to the Earth causing it to appear larger than normal. Super Moons heighten our emotional sensitivity. Don’t be surprised if both you and those around you are a bit touchy and emotional these days. The benefit to this phenomenon is that hidden or unexpressed emotions will come to the surface. What has been hidden emotionally will have the opportunity to be acknowledged, dealt with, and hopefully addressed and shifted. Lunar Eclipse – A Lunar Eclipse takes place when the Moon moves into the Earth’s shadow. The Earth is equally between the Sun and the Moon. This event has a very strong impact on our shadow side, our unpleasant patterns, belief systems, and behaviors. Not only will our shadows be highlighted, but the unfavorable behavior of others will come to light and be placed front and center stage as well. The blessing during this time is that what is not favorable, desirable, or ethical behavior will be brought out into the open for all to work on healing and correcting. Lunar Eclipses effect not only our emotions but also the relationships that are in our inner circle; our family, significant others and even the relationship with self. Eclipses can do 1 of 2 things. They can open us up to higher planes of consciousness, ascension for many or they can be warning us of challenging times ahead. Anyone who is reading this already has the understanding that in order for us to grow as a soul entity, we often need to be backed into a corner to push through our own challenges. Having this understanding, is a helpful reminder that there is a purpose to the suffering as we go through the occasional Sh#$storm. Blood Moon – When a Lunar Eclipse takes place, the Moon appears to darken in color as it moves into Earth’s shadow. When this happens, the Moon isn’t completely dark, it takes on a reddish color. What you are seeing at this time are sunbeams peeking out from the edge of the Moon, hence the name Blood Moon. The Blood Moon emphasizes the influence of being completely honest and truthful with yourself. When we are transparent, there is nothing to hide or cover up. Often there is a sigh of relief as we clear out the muck within our minds and negative ego. Let’s face it, there isn’t anywhere that is safe to hide. Full Moon in Leo – Last but not least, the Full Moon is in the sign of Leo. The spotlight will be on relationships – with self and others. First, it is best if we got really clear with our motives and on the processes of how we go about pursuing the goals we have for ourselves. Since everything is being brought out into the open, it provides us with the opportunity to face what is revealed and proceed ahead with the courage of Leo. You can bet there is nowhere to hide because Leo loves attention and knows exactly how to get your attention, as well as the attention of others. We will be harnessing Leo’s passion, drive and courage to make sure we heed the call our soul and at the same time Aquarius is going to help us to make sure we don’t stomp on anyone else’s toes. Chances are, you have been already been feeling the pressure of being more authentic with your dealings with others and self unless you’ve been living on a one-person island. People have been feeling out of their elements and the discomfort is there as a reminder to do something about what and whom makes you uncomfortable. If you are a shy person and have difficulty standing up for yourself and speaking your truth, then Leo will most certainly help you balance out that timidness. Below are some suggestions to help you ride the wave of this powerful and important Full Moon. Work with Fire. Leo is a fire sign and fire gets the ball rolling. Light candles with intention, participate in a fire ceremony and maybe do a reading with only the wands in your tarot deck. Take a bath with epsom salt, kosher sea salt, Himalayan salt and lavender to help you process your emotions. Get cord cuttings as often as you feel the need to. With intention, cut the cords to people, places and things that are toxic to the evolution of your soul. Listen to hemi-sync meditation frequencies. They will help balance out both sides of the brain. Exercise outdoors, go for a walk, hike or run. The fresh air will do wonders for you. Have a game plan. Write down your goals for the next 12 months and don’t play small. The sky is the limit. Work with cinnamon and close essential oils in your diffuser or breathe in the combo to give your spirit a jumpstart. Don’t be a drama queen. With these energies, you may find yourself to be a bit overreactive and causing some drama. Catch yourself before you work yourself into a tizzy. May the spirit light the way for you during times of challenge and difficulty. Love is all there is.